The Communications Department functioned as a separate civilian county department reporting directly to the Sheriff from 1934 until 1958, when it was consolidated into the Transportation and Communications Department. Communications was later established as a separate division under the General Services Agency. In 1996, during a Countywide reorganization, Communications was transferred back to the Sheriff’s Department. 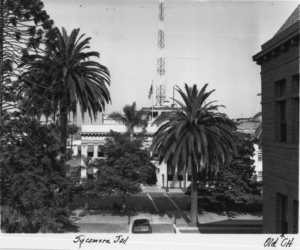 The establishment of the radio station with the call sign of KGHX (licensed on 2490 kHz) took place on the fourth floor of the County Sheriff’s Office located in Santa Ana (Sycamore Street Jail) on March 2, 1934, just one year after the Long Beach earthquake. On that day, the first official all-points bulletin from KGHX was broadcast. It was reported that Charles “Pretty Boy” Floyd, the notorious gangster, had been seen west of Anaheim two days earlier. The Chief Radio Operator, Wendell Jones, headed a staff of three radio operators: Ed Hefner, Myron Gemmill, and Walter Whiteman. Not only were these men pioneers in the field of police radio communications, but they also possessed the vision to see the importance newly emerging radio transmission could have on public safety. The operators soon discovered that the “one-way” system had shortcomings. When the radio station received a telephone call about a crime, it would repeat the message over the air every two to three minutes and hope the right police car would get the call; however, there was no efficient way for the police cars to reply. Some retired deputies recalled that they were instructed to keep a few dimes in the bottom of their handcuff cases to call the station using a pay phone to acknowledge receiving a one-way radio call, as Orange County never had police call boxes for such purposes. 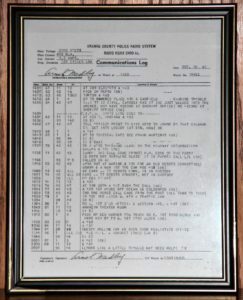 In 1936, the Chief Operator, Walter Whiteman, arranged for KGHX to be licensed to operate interstate Law Enforcement Communications by way of Morse code (CW) on 5140 kHz. 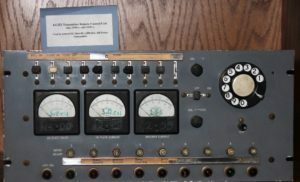 This allowed the station to receive messages regarding criminal activity in other states and to place them on California’s statewide police Teletype network for appropriate distribution. KGHX was one of the few stations in the state providing this service. After the Chief Operator’s relentless testing of a homemade mobile transmitter placed in his own car, “two-way” radio transmitters were perfected and installed in all public safety user vehicles, allowing them to respond to calls from the station. 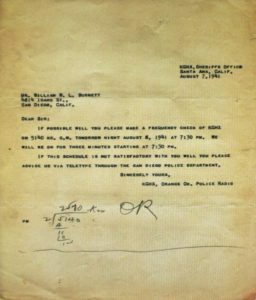 This occurred in 1937 with Sheriff Jesse Elliott’s support of the radio station. 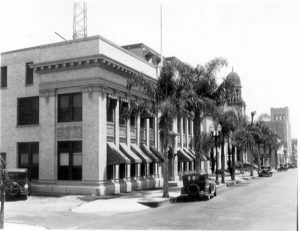 Because of the station’s progressive efforts, public safety communications were effective in responding to the threats presented by the 1938 flooding of the Santa Ana River throughout Orange County. The KGHX radio call sign in itself has had some interesting history. In March of 1928, KGHX, Richmond, Texas was authorized. The license was held by the Fort Bend County School Board which served the rural schools in the county. According to the Vernon Daily Record, the station first broadcast at 9 am on Monday, November 11, 1928. The equipment was located in the office of County Superintendent Jesse F. Ward in the old county courthouse in Richmond. Fort Bend was the first district in Texas to get such a permit and each rural school in the district was equipped with a 6 tube receiving set with loud speakers. Ward was quoted as saying there were “untold possibilities in the use of radio for educational work.” According to listings in the Radio Digest the station operated on 199.9 meters, 1500 kc, with 50 watts. In November, 1929, KGHX was one of about 20 stations nationwide which were ordered to suspend operations due to the failure to file a renewal request. The Federal Radio Commission was reportedly trying to make a point about operating without a license and the story made newspapers all across the nation. Suspended stations would have to undergo a hearing before the commission to regain authorization3. Gary Gray, Norma Roberts, “Happy Birthday OCSD/Communications”, County of Orange RACES Net Control Newsletter, March, 2004, Pages 3-7. Ray Grimes is a member of the APCO Historical Committee. Ray is also the Founder/Co-Director of the Orange County Sheriff’s Museum & Education Center, an Orange County Sheriff’s Reserve Captain, and retired Orange County Sheriff’s Department Communications Division Assistant Director.